At the sea side and in high mountain regions the interfering UV components of the daylight can cause blueish and blurry pictures. The B+W UV-Haze-Filter Digital MRC nano blocks this part of the light and enable better photos. 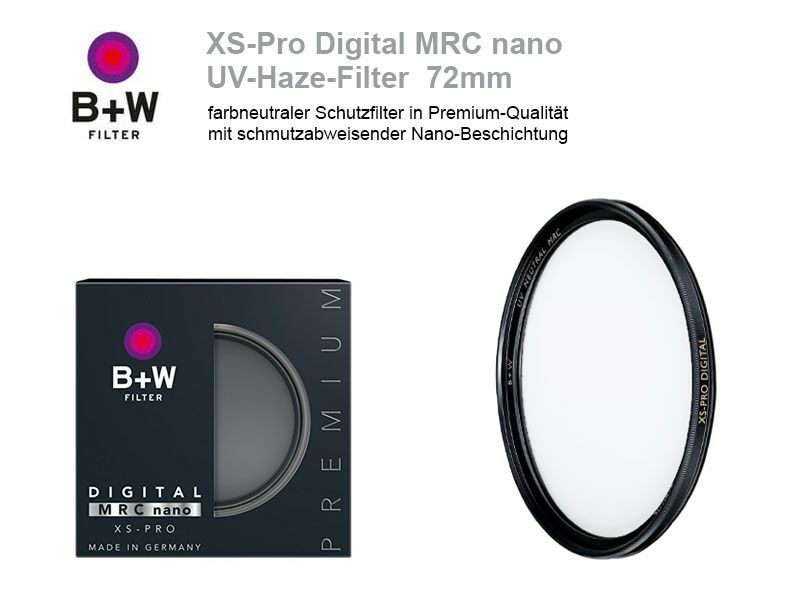 Since the B+W UV-Haze-Filter XS-Pro Digital MRC nano is absolut color-neutral and has no influence on the exposure, the filter can be left permenantly on the lens and like this works as a front lens protection against dust, water and other stainings. For an easier cleaning the filter has an additonal nano coating that works dust and water repellant. Furthermore the filter has a MRC coating on both sides that minimises ghostings. Despite its slim construction, which makes it compatible even with wide angle lenses from 18mm / full format (12mm APS-C), the filter has a front thread. It is build of solid brass, matt black chromed. This Product was added to our catalogue on Thursday 15 October, 2015.